Home » 18th century. French fashion. Period of Louis XV. After a drawing by Watteau. Modes Ancien Régime. 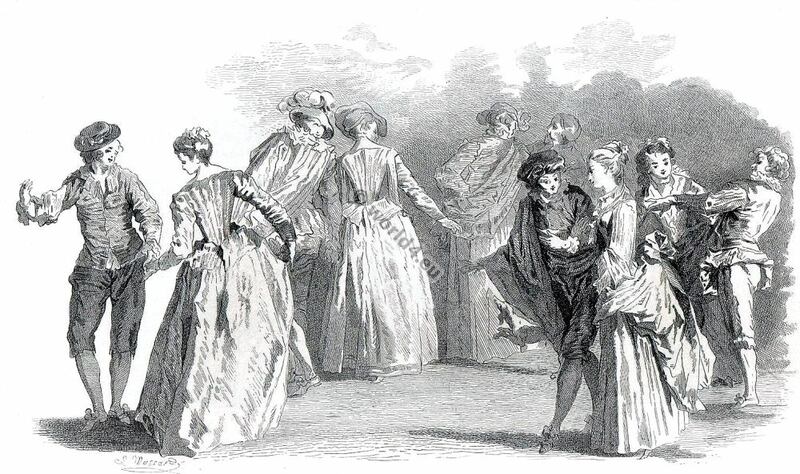 This engraving is a servile reproduction of a design by Watteau. In the original however the outlines only are traced by the pen, whilst the model has been obtained by a wash in sepia. We could not make use here of that process, and so we compelled to replace it by hatchings. This graceful round, where fancy and historical truth of costumes do not exclude each other is, we dare say, a quite interesting page of sumptuary art. XVIII Siècle. Modes Françaises. Époque de Louis XV. This entry was posted in 18th Century, Ancien Régime, France, Rococo and tagged Rococo fashion on 11/6/14 by world4.